Happy NTT, friends! If you missed my post yesterday, I finished my Birthstones quilt, and am celebrating my three year blogiversary with a giveaway. Check out my post HERE to enter! Lately, I've been working on a lap size quilt in my Bubble Bath pattern, with a really fun color palette! 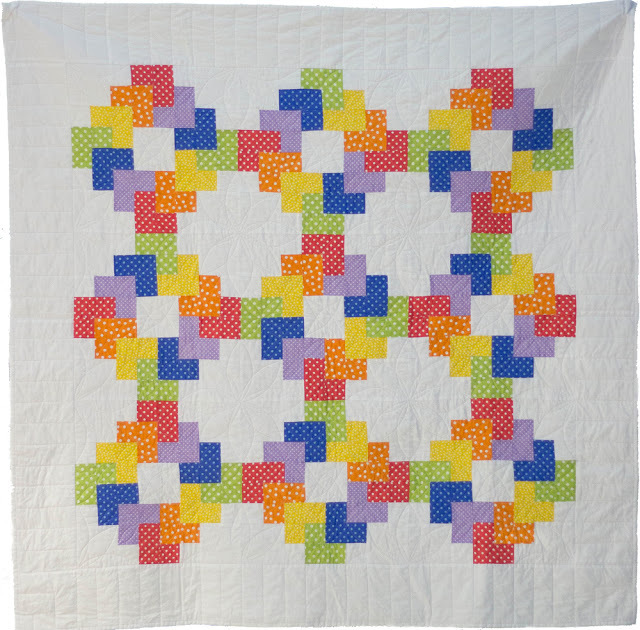 It's no secret that in the past, the vast majority of my quilts were either donated, gifted or sold. So, when I started scheduling trunk shows and classes this year, I realized that I needed to remake some of the quilts that had long gone onto other homes, particularly the quilts for which I've written patterns. It's really fun to revisit each of my patterns and show them in a different light. My original Bubble Bath quilt was made in shades of pink and gray for a nursery and was very soft and sweet, and this one in bright colors feels more fun and whimsical to me. 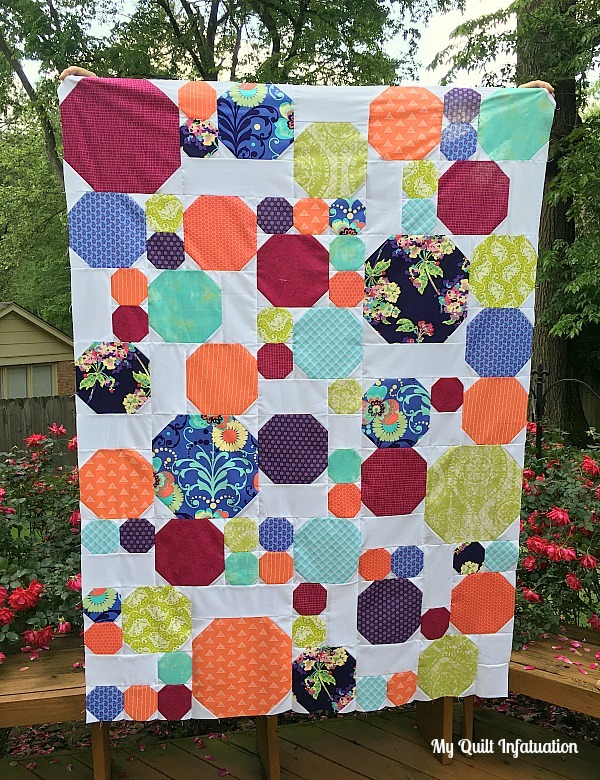 I'm looking forward to getting this one quilted! So, check out some highlights from last week's party that caught my eye! 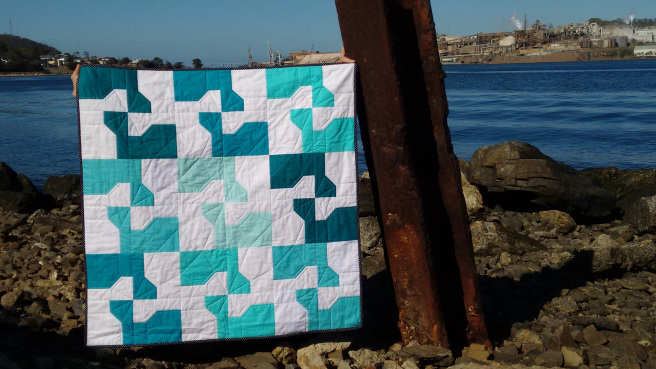 Kalinda Handmade shared this happy quilt! This fresh beauty is by Deb at New Creative State. and this cutie is from Jamie at Sew Brainy! Loving the birthstones quilt. Very fun! I think revisiting older designs is always a good idea. As time passes, so does your fabric taste, colors and fabric lines. It's amazing how different a pattern looks with different fabrics! I like the new version of Bubble Bath. It's bright and very cheery. Plus a great place to feature some of those large scale prints we both love. It's fun to revisit old patterns too. That's what I did earlier this year with the orange/mint Amy Butler Cascade that you so kindly featured here. Isn't it fun to revisit your patterns and do a remake? Congratulations on the exciting stage of providing trunk shows, Kelly. Wish I lived close enough to come see you and your quilts in person! It is fun to see the same pattern done in different fabrics. Enjoy thinking out your remakes.